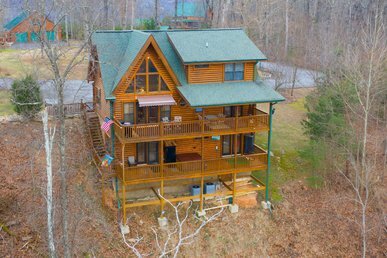 Location: Pigeon Forge, TN (3 miles to Parkway) This amazing private wooded cabin near the Parkway, "Private Paradise:"#2810" has everything for a great vacation! 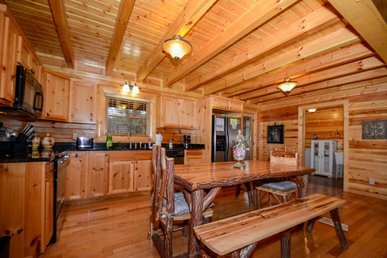 This family-friendly, pet-friendly vacation mountain home is larger than most with three giant king bedroom suites and huge recreation room. 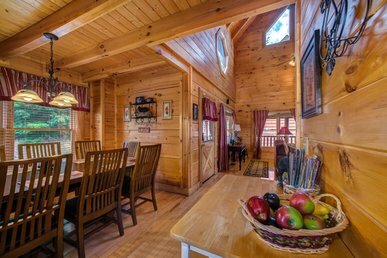 The bottom level offers a home movie theater, pool table area, video arcade game, bunk beds, separate bathroom, and so much more! 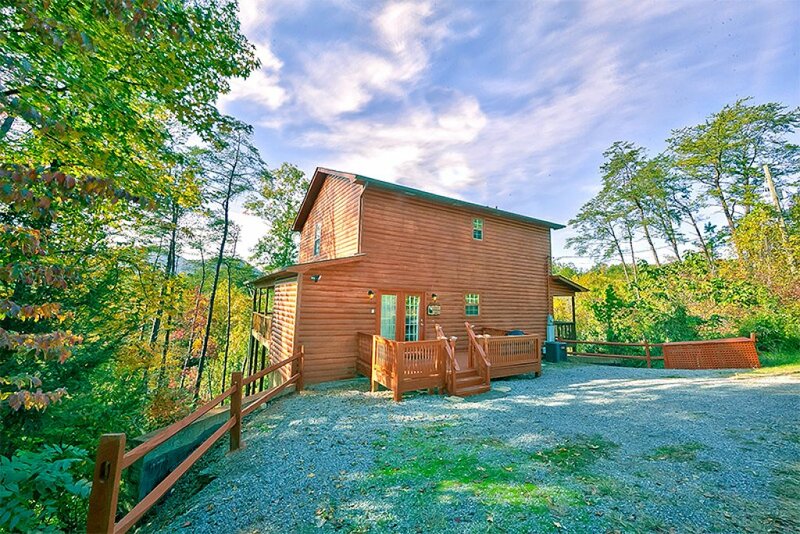 This Pigeon Forge cabin is very inviting & packed with entertainment. 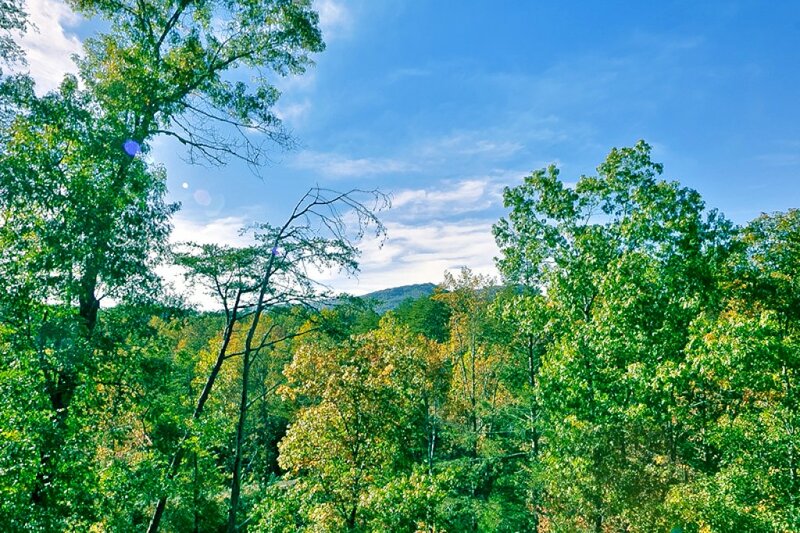 You will have fond memories of your wonderful vacation in the Smoky Mountains. 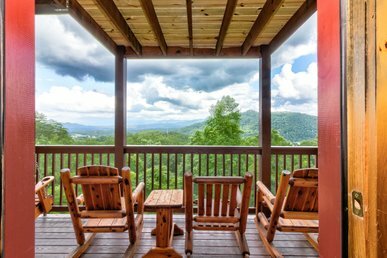 Private Paradise is a private cabin close to the Parkway, which features some of the best restaurants, shopping, & attractions in the South. 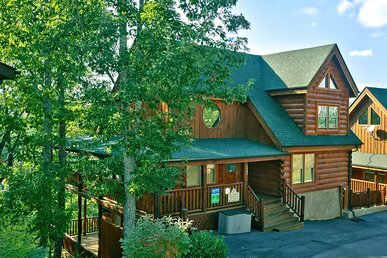 It has an amazing amenity package for your family & friends which include: air hockey, foosball and a projection movie theater! 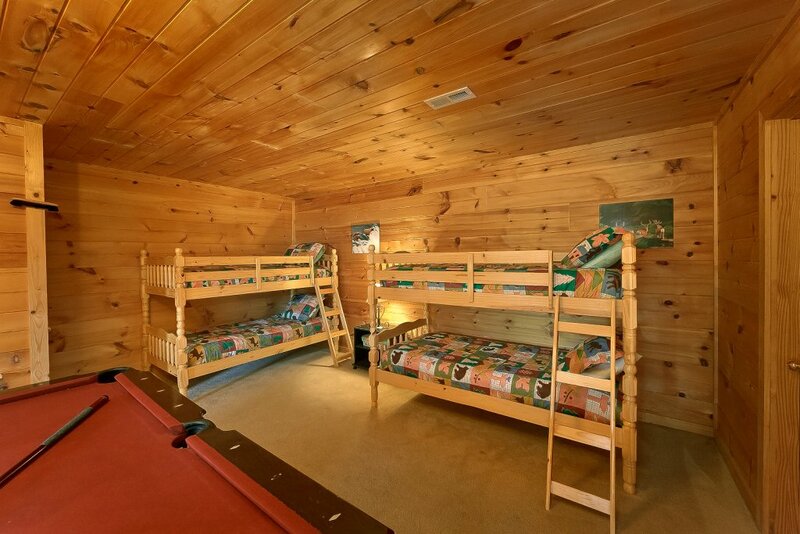 There are 3 king beds,2 sets of bunk beds (downstairs) & a brand new, very comfortable sofa sleeper (main floor). 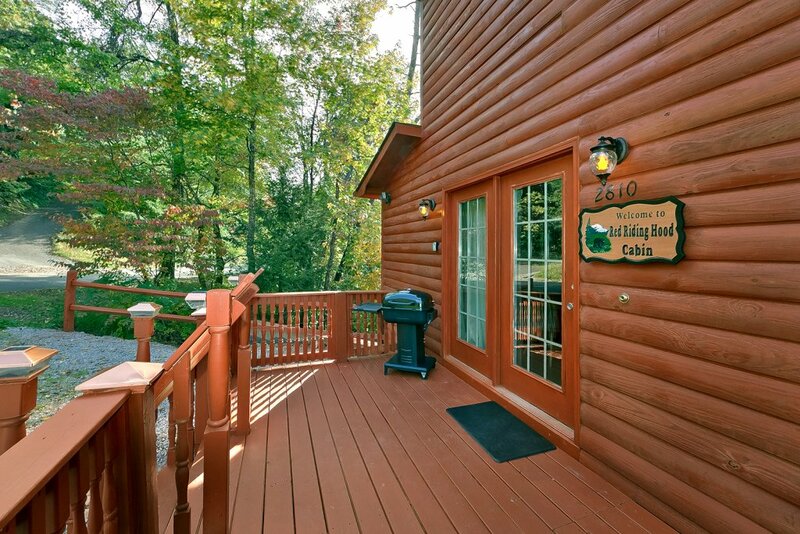 Enjoy wifi internet access & a gas grill for all of your meals. Most bedrooms enjoy their own premium TVs. 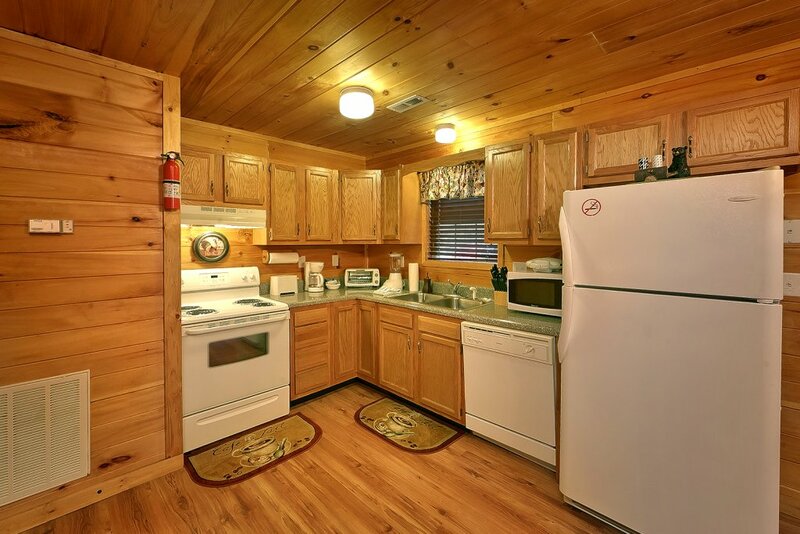 They have large closet spaces and stand-up washer & dryer, which is great for extended visits. 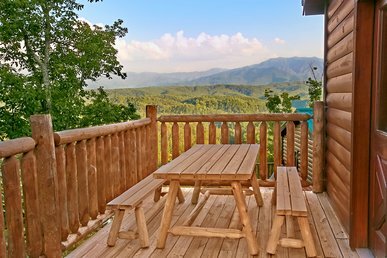 This vacation cabin rental in Pigeon Forge is very spacious with larger rooms than normally found in this rental market. 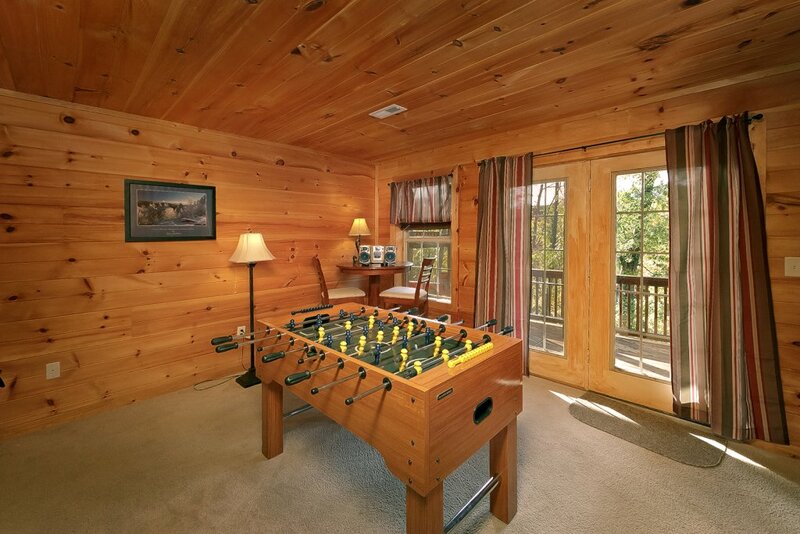 The kid-friendly gameroom & theater room are the focus of this amazing vacation rental cabin. You will enjoy your stay at Private Paradise & appreciate this fabulous location! Reserve today. Price is for 6 guests. Each additional guest is just $12.50 nightly. 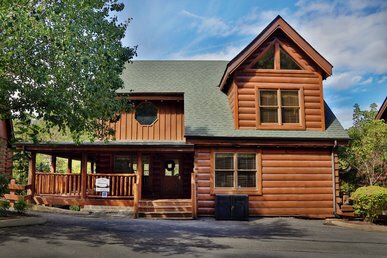 Cabin overall was exactly what we needed for our families. With little kids it was nice to have 3 separate floors for privacy and allow the kids to have their own space. 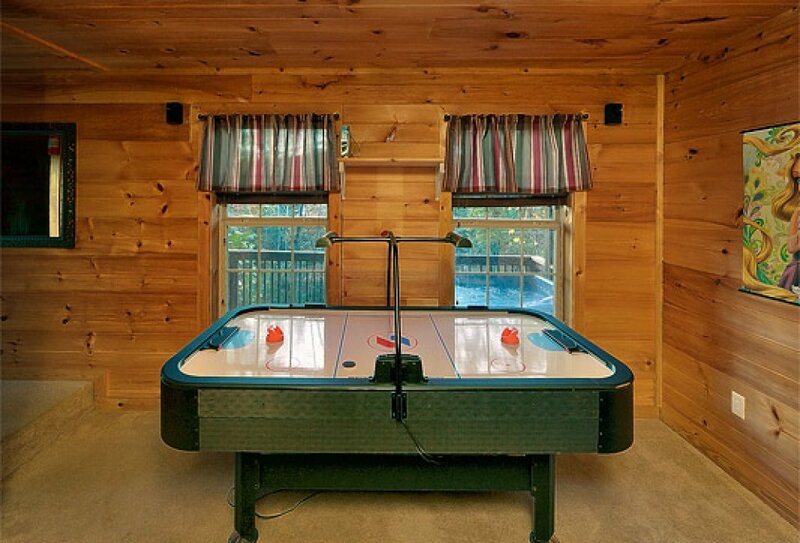 Needs a little attention to the pool table sticks and air hockey game but still worked fine enough for the kids to enjoy. Only down side I guess would be there is no where for the kids to play outside but I would stay here again. This rental was for a birthday party with 6 women in attendance. This cabin is not cleaned properly, the hit tub was very cloudy and bubbled foam, so we avoided it, the bathroom in the main floor has filthy built in the corner by the tub, sink hadn't been cleaned, and hairs on the shower wall. The wood floors have a lot of dust balls everywhere and when you walk up the stairs there is duty and dust on every tread. Carpets are insanely dirty. 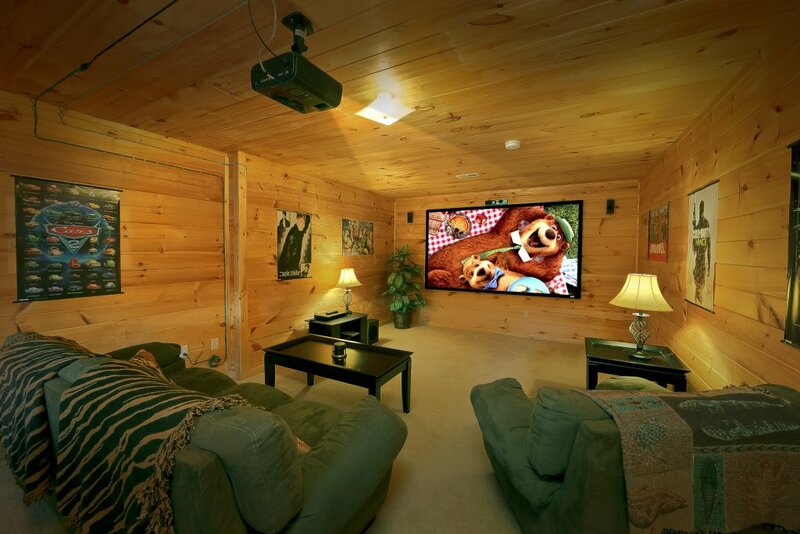 The fireplace(No gas), grill(nasty built up food and no gas)and surround sound were unable to be used. It has all of the games you could want for any age, beds were comfortable other than questionable cleanliness of linens. Bummer weekend especially for the price. Auntbugs was flawless as per usual. We have stay with them many times throughout the years, the staff is great and always helpful. Just a few things that need addressing. The shower in the master bedroom does not work we had to use the one upstairs which was inconvenient. Also the exhaust fan in the master bath does not work, if you flip the switch it will hum but not come on. This could be a potential fire if someone forgets to turn if off. One of the tvs one the upper floor doesn’t work. The fireplace did not work, it may have been empty but either way it was not useable. One of the heat pumps was running on emergency heat which ran most of the time. It did not seem as if it could heat good enough to kick off. All of the toilets have leaks from the tank to the bowls which made them run once the water level reached the trigger point ithey would start filling. All through the day and night. The cabin needed a good cleaning. None of this ruined our trip but had these things been working correctly it would have been better. 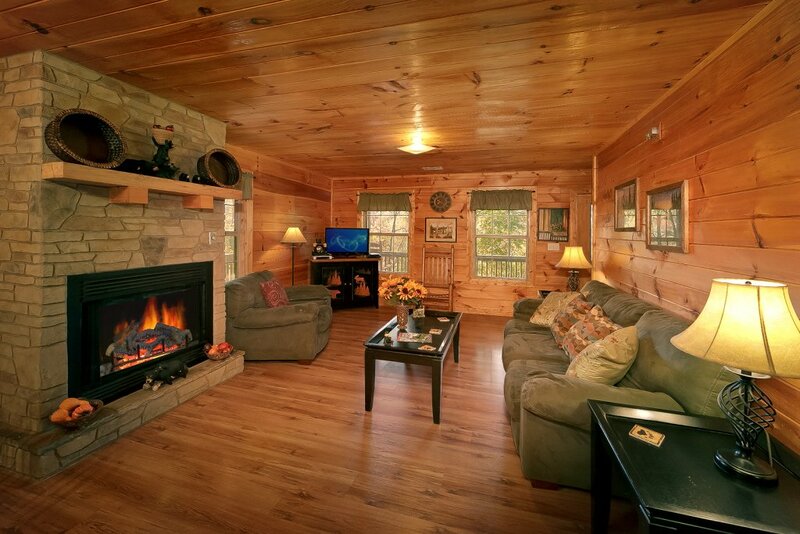 I would like to say, first off, the cabin was nice and in a quiet spot which was great for relaxed family time. However, when we booked the cabin we were informed there were 3 walk in showers to accommodate older/handicapped adults. This was not the case. There were 3 tubs with showers. This led to a difficult showering experience to say the least. We had to buy assistive devices which wasted a few hours of our vacation time to find and purchase. There were no cables to attach the DVD player to the movie room projector so ...no movie night.The throw pillows were well used and did not appear clean. Bunk bed mattresses did not have covers on them but they appeared clean. Bring your own pillows!This site did not provide wash clothes or hand towels. No kitchen towels. Bring your own.Kitchen was fairly well equipped. You may want to bring small containers for left overs and don't forget the tin foil.Most of the refrigerator door shelves were missing the bin/guard part that keeps items on the shelves. So this will limit space in the fridge. 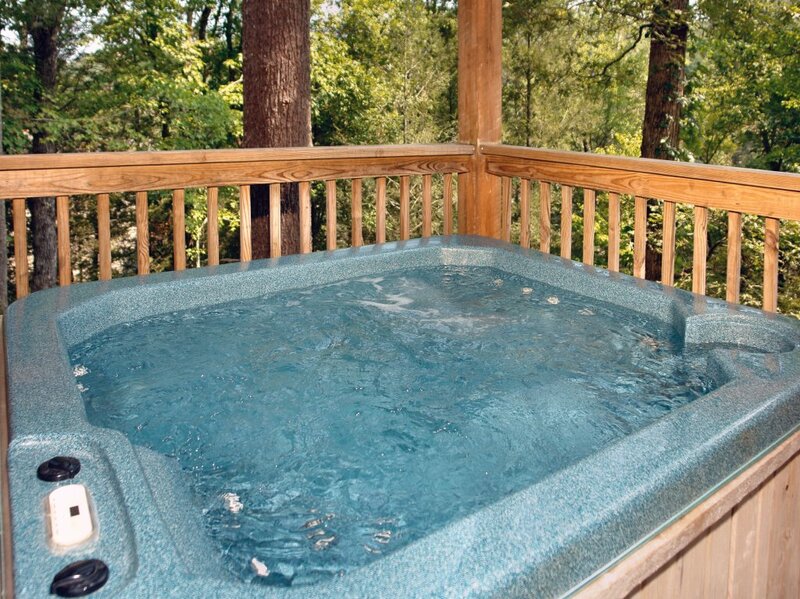 The hot tub was nice and relaxing but could use a step to get in and out of it easier. 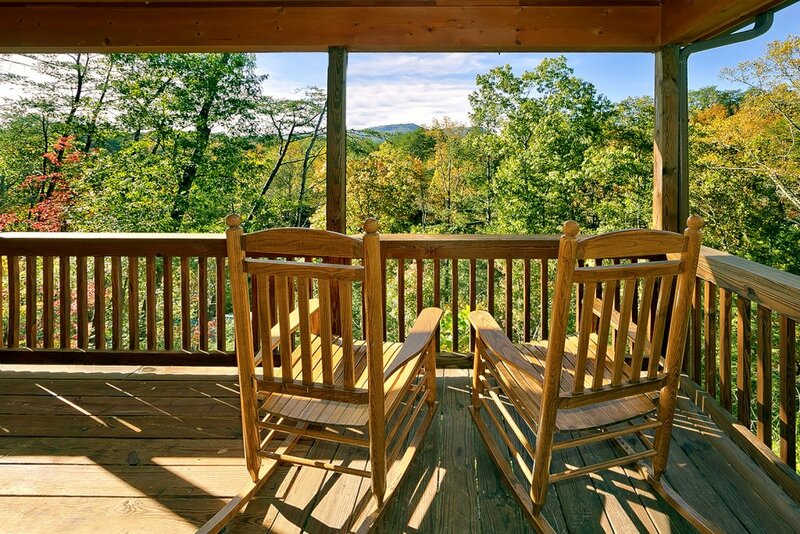 Not conducive to older adults with limit mobility.We enjoyed sitting on the porch in the 4 rocking chairs. View of the trees, not much view of mountains.Washer and dryer were regular size which was a wonderful surprise. Dryer did not dry well so took longer to dry a load. There was also not enough seating in the living room for the 5 adults. We used kitchen chairs to watch t.v. so not a major issue. 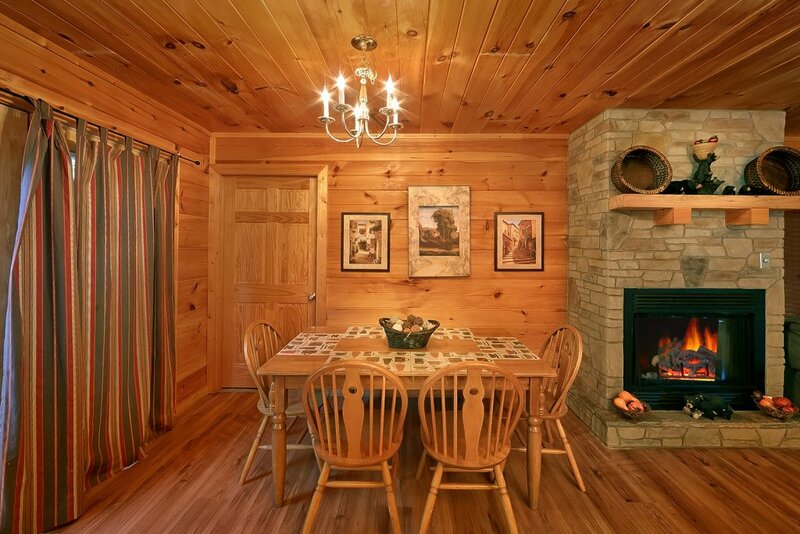 So, the cabin is in a good location, near a lot of antique shops and grocery store. 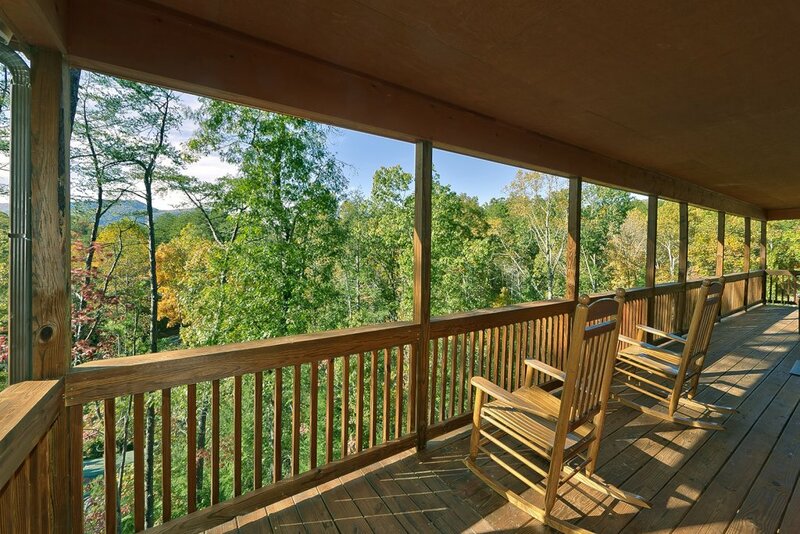 It is in a quiet area where we enjoyed taking walks on the road and sitting on the porch. Nice game room.Over all okay place, just not what we were told. Probably better for those with teenagers that need their own space than groups with older adults or those with limit mobility. Lots of stairs and no walk in showers. We enjoyed our stay this past week. 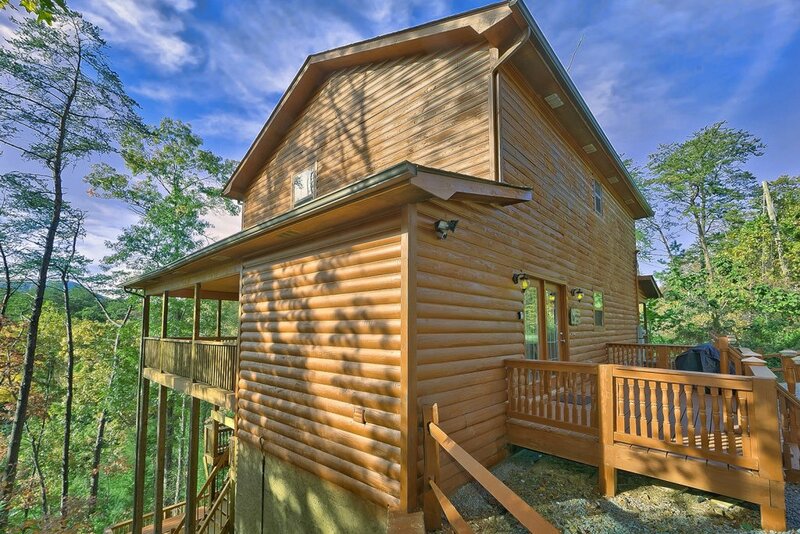 This cabin is not totally secluded as it sits above a private residence w/a rather rude person living below. This was our only concern we would share-especially if you have young children w/you on your visit. To be sitting on the back deck at 8 a.m., enjoying a cup of coffee and the view and have someone below scream out "It's 8 o'clock in the G+* D#^*n morning" was definitely a black mark. Apparently an excited lil 3yr old coming out to say good morning is more than they could handle. The property below the trash bin does have a fair amount of litter, that i attribute to critters getting into the cans which had no lids. We do apologize that the person below you was so rude! We hope you will give us another chance, and hopefully try another cabin. Make sure to mention you are a repeat guest for additional savings. Thank you for the valuable feedback! The cabin was nice and in a great location. It had everything needed for a nice vacation. 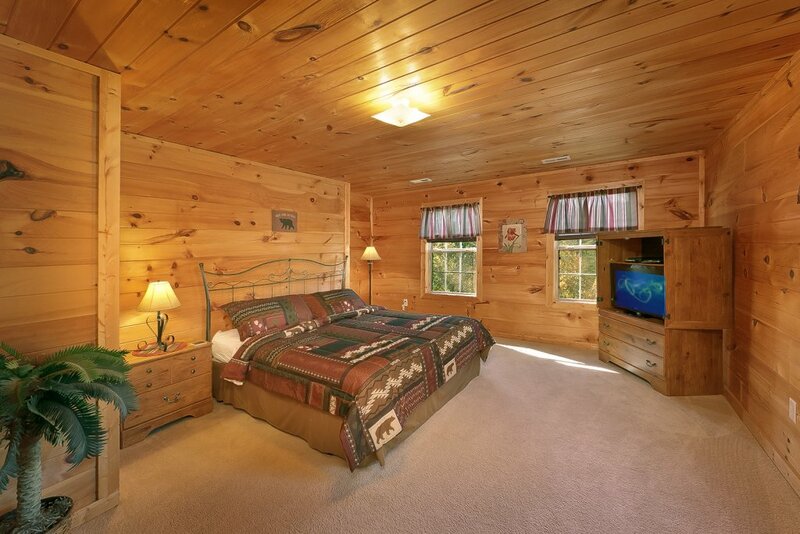 We are glad to hear that we had the accommodations you were looking for, and we do hope to see you again soon. Thank you for the great feedback, and make sure to ask about our repeat guest discount at the time of booking for a great discount. We stayed four nights with our three teenagers. The cabin was very clean, comfortable, and roomy. So convenient to everything we wanted to do. Will stay here again! Chris, we are happy to hear that you enjoyed your stay in Privater Paradise! Make sure next time to ask about our Repeat Customer discount. Our family spent 5 nights at Private Paradise in June of '18. Overall, it was a good value. 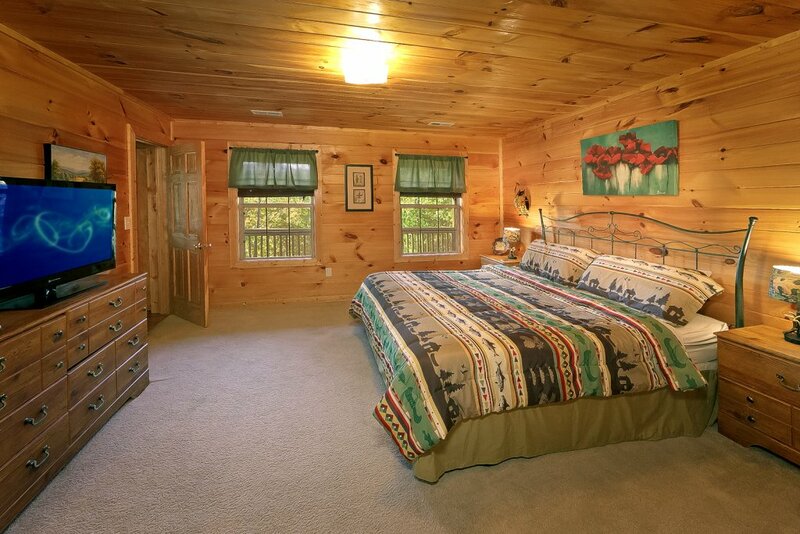 There were other comparable cabins but this one won out on price. 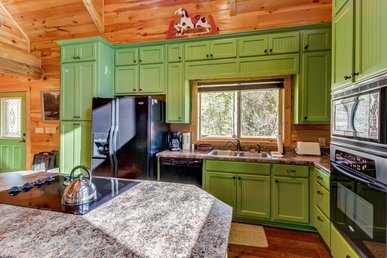 The location is beautiful and private. Unfortunately, the pictures on the website are outdated. The carpet in the lower level is dirty and worn out. The air hockey table has seen better days. There is hardly any felt left on the hand held tools. 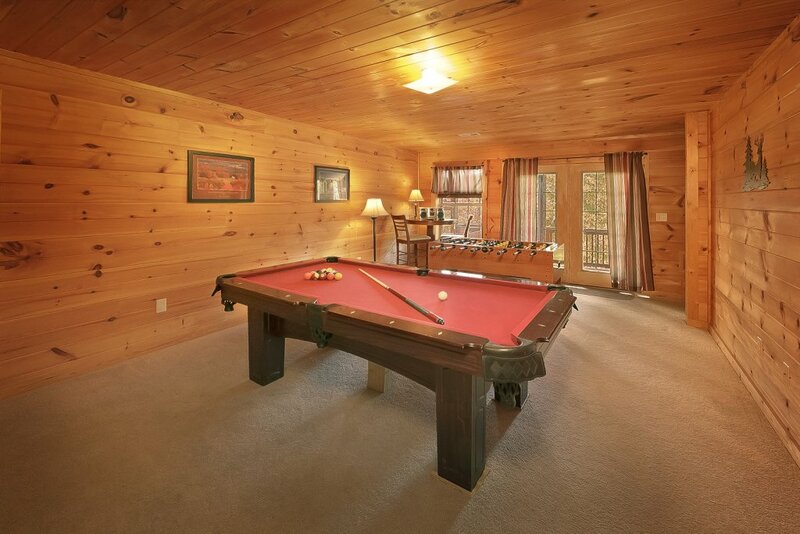 The pool table is missing a striped ball so it was replaced with another solid. Some of the beds could use new mattresses. Despite these items the rest of the cabin was incredibly clean. Aunt Bug's staff was very friendly and professional. If we come back to the area we will use Aunt Bug's again. My family and I went visited Private Paradise over the Memorial Day weekend. 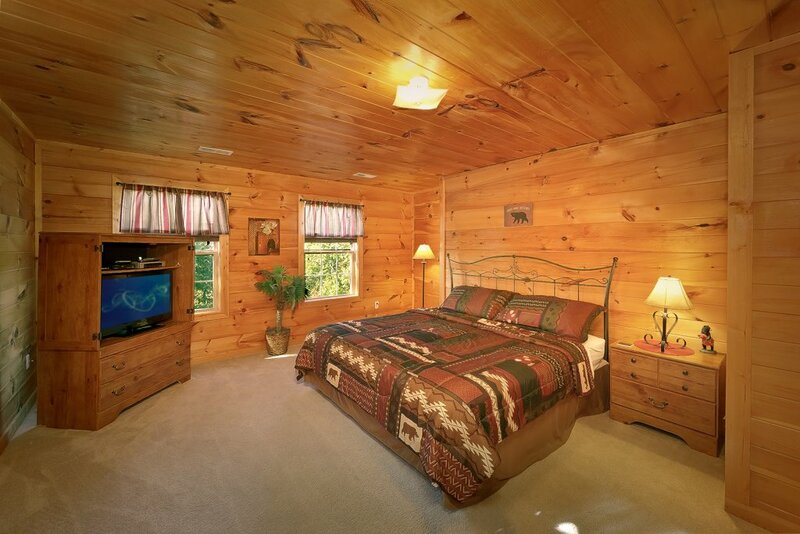 When booking the cabin, the pictures online looked amazing. 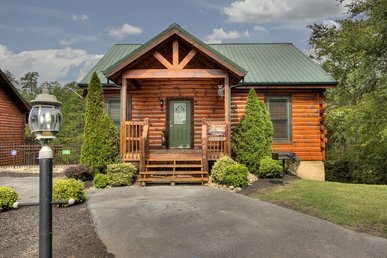 The price was pretty high for 3 nights, but we splurged since we were celebrating a birthday and the Memorial Day weekend. The size of the cabin was great and so was the location, but we were very disappointed in the condition of the cabin. The cabin had mosquitos to the point of having to go out and get repellent to even be indoors. The linens were dingy, there was a lot of dust, there were spider webs on the mantel, and the stains on the carpet were horrendous. We had bought several DVDs to watch but we couldn't get the downstairs movie theater to work, so we tried the DVD players in the rooms, but they didn't work either. We had to return our movies unwatched. We wondered how long it had been since cabin had been rented out or checked on as fall decorations were still up. I never leave reviews, good or bad, but after getting a 2nd request wanting me to leave one, I felt I needed to so that these issues could be addressed for the next renter. Property was not clean. Carpets were filthy. Air hockey table was scratched and did not work properly. The unit smelled like smoke from the previous occupants. There was garbage on the deck from the previous occupants. There was no mop in the unit so the floors could be cleaned.